If you know me, one of my favorite brands of tea to brew is PG Tips. It is usually my go-to tea for whenever I feel like I need a good pick-me-up or something to warm me up in the cold days of winter. It was one of the first British teas I tasted before I really began to dive into British food and culture and I introduced it to my young nephew, keeping the love for PG Tips well into the next generation. While plain black tea is what they started with, PG tips recently began to expand their tea line from beyond the standard black tea. 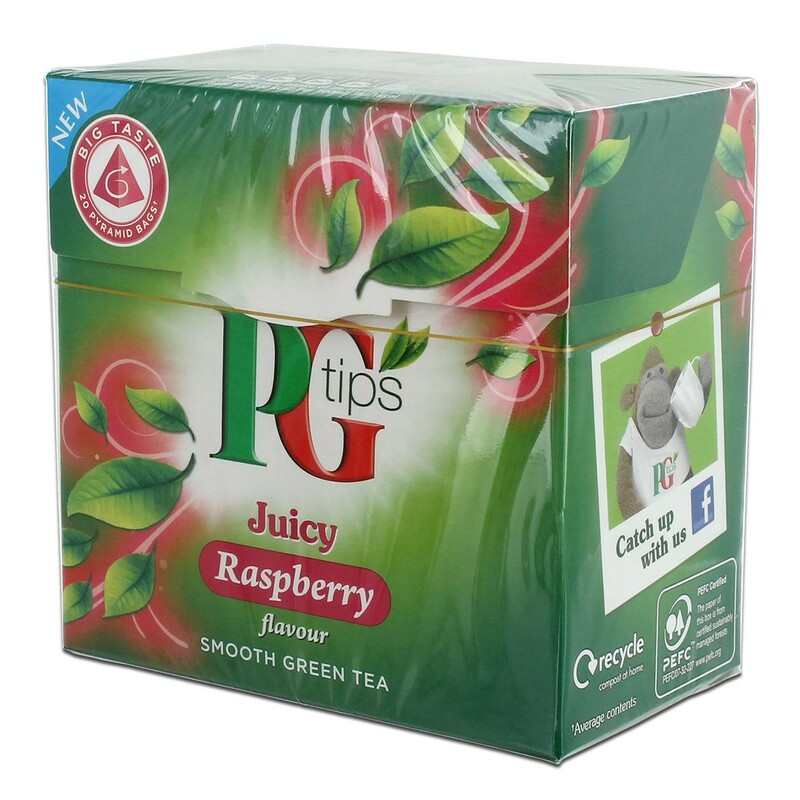 While there is loose leaf and decaf, PG Tips has ventured into the world of green, herbal, and fruit teas. Five varieties of green tea have been produced by PG, Pure Green, Juicy Raspberry, Fragrant Jasmine, Vibrant Mandarin Orange, and Zesty Lemon. Each box of green tea has 20 bags and is a fine blend from Indonesia and Kenya. All but the Pure Green are infused with a floral or fruity flavor. Perhaps you fancy a more lighter taste and less caffeine? That’s where the herbal teas come in. Delicate Camomile, Refreshing Peppermint, Smooth Redbush and Vanilla, and Aromatic Spices and Mint are all here to soothe you. Camomile is infused with delicate flowers, Peppermint is a clean and refreshing minty goodness, Redbush and Vanilla is a mixture of South African Rooibos, vanilla flavor, hibiscus flowers, and cranberry, and finally Spices and Mint is a combination of familiar spices like cinnamon, mint, and a bit of orange. Still prefer black tea? 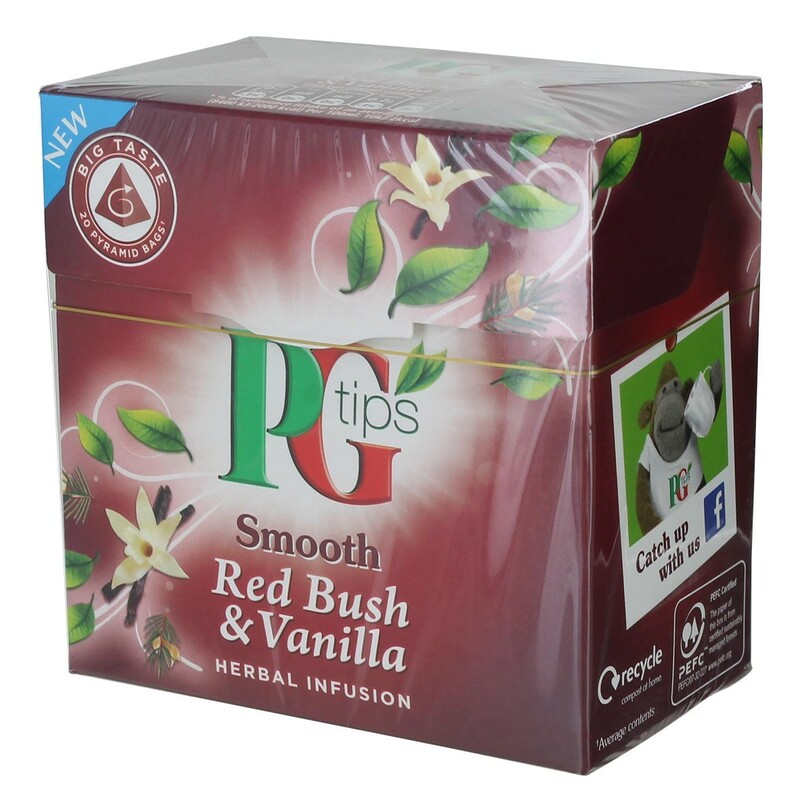 There are some new varieties that PG tips has in store such as the Strong One and the Fresh One. The Strong One has a bright red color when brewed, a malty aroma, and a bold tea character. This tea is blended from teas grown in Kenya and other African nations. The Fresh One is also red when brewed, and this tea is a Breakfast Blend plus English Breakfast, all blended from tea grown in Kenya. It is hard to choose from all these varieties! I like to expand my horizons and try new tea but if you’re a tea lover like myself, you might have a large cupboard full of tea! Have you tried any of these flavors? Let us know!